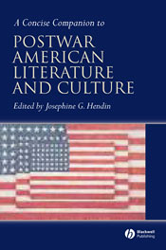 This Concise Companion is a guide to the creative output of the United States in the postwar period, in its diverse energies, shapes and forms. Embraces diversity, covering Vietnam literature, gay and lesbian literature, American Jewish fiction, Italian American literature, Irish American writing, emergent ethnic literatures, African American writing, jazz, film, drama and more. Shows how different genres and approaches opened up creative possibilities and interacted in the postwar period. Portrays the postwar United States split by differences of wealth and position, by ethnicity and race, and by agendas of left and right, but united in the intensity of its creative drive.